With tax revenue still declining as a result of the recession and budget reserves largely drained, the vast majority of states have made spending cuts that hurt families and reduce necessary services. These cuts, in turn, have deepened states’ economic problems because families and businesses have less to spend. Federal recovery act dollars and funds raised from tax increases have greatly reduced the extent, severity, and economic impact of these cuts, but only to a point. And federal aid to states is slated to expire well before state revenues have recovered. The cuts enacted in at least 46 states plus the District of Columbia since 2008 have occurred in all major areas of state services, including health care (31 states), services to the elderly and disabled (29 states and the District of Columbia), K-12 education (34 states and the District of Columbia), higher education (43 states), and other areas. States made these cuts because revenues from income taxes, sales taxes, and other revenue sources used to pay for these services declined due to the recession. At the same time, the need for these services did not decline and, in fact, rose as the number of families facing economic difficulties increased. These budget pressures have not abated. Because unemployment rates remain high — and are projected to stay high well into next year — revenues are likely to remain at or near their current depressed levels. This has caused a new round of cuts. Based on gloomy revenue projections, legislatures and governors have enacted budgets for the 2011 fiscal year (which began on July 1, 2010 in most states). In many states these budgets contain cuts that go even further than those enacted over the past two fiscal years. Cuts to state services not only harm vulnerable residents but also worsen the recession — and dampen the recovery — by reducing overall economic activity. When states cut spending, they lay off employees, cancel contracts with vendors, reduce payments to businesses and nonprofits that provide services, and cut benefit payments to individuals.All of these steps remove demand from the economy. For instance, at least 44 states and the District of Columbia have reduced overall wages paid to state workers by laying off workers, requiring them to take unpaid leave (furloughs), freezing new hires, or similar actions. State and local governments have eliminated 407,000 jobs since August 2008, federal data show. Such measures are reducing not only the level and quality of services available to state residents but also the purchasing power of workers’ families, which in turn affects local businesses and slows recovery. German prosecutors have launched a preliminary investigation into whether two Russian dissidents living in Berlin were poisoned, a spokesman told Agence France-Presse on Monday. “An investigation has been opened. It is being carried out by a department dealing with politically motivated crimes,” a spokesman for the public prosecutors’ office in the German capital said. The German weekly Focus reported earlier this month that doctors had detected in Viktor Kalashnikov, a former colonel in the Soviet KGB, and in his historian wife Marina Kalashnikov dangerously high levels of mercury. Both have suffered health problems, with Marina losing half of her hair and Viktor considerable weight, and medical experts have recommended that the couple undergo further tests and be watched closely, the magazine said. “Moscow poisoned us,” the husband told Focus. The couple has worked as freelance journalists since the late 1990s, publishing articles that have angered the Kremlin. They arrived in Berlin in September. Focus earlier this month reported that doctors at Berlin’s Charite hospital found 53.7 micrograms of mercury per liter in the 58-year-old dissident’s blood and 56 micrograms in his wife’s body. “The maximum safe level is between one and three micrograms of mercury in a liter of blood,” the magazine then quoted Frank Mertens, a toxicologist at Charite, as saying. In 2006, dissident Russian spy Alexander Litvinenko was murdered by radio-active poisoning in London, prompting an icy period in Moscow’s diplomatic relations with Britain. In the management of Information and Public Relations Moscow police say that the rally passed without incident. Journalists working for the campaign estimate the number of participants at about 2,5 thousand people. 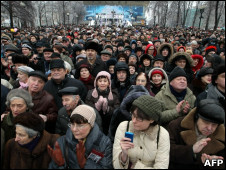 In the Russian capital’s police department said in a rally attended by about fifteen hundred people. The organizers say about 4 thousand. The action came in response to a ride in recent years in Moscow and other Russian cities rioting and clashes on ethnic grounds. Despite the fact that the rally was attended by many politicians, including the organizers of the “Marches of Dissent” and shares the 31 th, political slogans may sound. The gathering were popular Russian film actors and directors, writers and public figures. Writer Viktor Shenderovich read a letter from Elena Bonner, who was unable to come to the Pushkin. 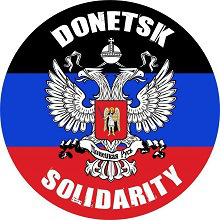 “Think of what I went there again to save the motherland, even though his legs do not walk” – ended with the message of his wife of Andrei Sakharov. Came to the rally director Pavel Lungin, poet Dmitry Bykov, actress Chulpan Khamatova, the governor of Kirov Region Nikita White and many others. Another rally was held Sunday at the White House, where a group of activists organized a performance in support of former Yukos head Mikhail Khodorkovsky. 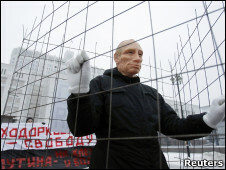 Established a group of protesters in front of the home government a symbolic cage, which was placed a masked man Putin. Along with this, they unfurled a banner calling to release Khodorkovsky, who on Monday shall be declared the verdict on the so-called second Yukos case. The rally was foiled by police. As a result, briefly detained several photographers protest. remembering the services she rendered to the country and its poor people with complete dedication and commitment. Criminal conspirators killed her when she delivered her historic speech at the mammoth public meeting at Liaquat Bagh in Rawalpindi and she was on way back to her residence in Islamabad. There was no post mortem examination of the dead body and it was handed over to her husband for burial with it. The Government is responsible to undertake post mortem examination immediately and as per laws of the land. But it was not done presumably on the instructions from the higher ups. There was a definite conspiracy to eliminate the first woman Prime Minister of Pakistan as she had been receiving threats from hostile elements. The Government was responsible for providing security to every citizen of Pakistan, particularly the national leader who remained prime minister of the country twice and leading the biggest political party of the country for the past many decades. Before leaving UAE for Pakistan, she told newsmen and close aides that she is facing threat for her life and despite this fact, she would return to Pakistan ending her decade long self exile during the entire regime of General ® Pervez Musharraf. Off and on, Pervez Musharraf was reminding the people of Pakistan, obviously through media, that he would not permit Benazir Bhutto and Mian Nawaz Sharif to return to Pakistan and their political activities. Even he was opposed to Benazir’s return to Pakistan despite an agreement brokered by the United States Government. She held direct talks with Pervez Musharraf in Abu Dhabi in presence of top US officials of the State Department. Despite that agreement, he refused to permit her to return to Pakistan. However, she came back and landed in Karachi where more than two million people received her at the Airport. Before she reached her residence in Clifton, he came under terrorist attack at Karsaz leaving more than 180 people, all her personal and party guards, were killed and over 500 injured in a massive bombing attack. The military dictator was opposed to holding huge public meetings and public rallies and advised the former Prime Minister not to hold such mammoth public meetings and public receptions as it heightened the sentiments of the people against the military dictatorship ruling this country for a decade for the fourth time in our national history. The United Nations had conducted the investigations during which the Rawalpindi Police chief made disclosures that the site of crime scene was washed at the behest of high officials very close to Pervez Musharraf. When the FIA started the investigations, he backed out of his earlier statement given before the UN Commission. Now the FIA had widened the scope of investigation and collecting evidence against other top officials who might have played some role in washing out the evidence or others who instigated the murder of the former Prime Minister. Five of the people, including the two top police officials of Rawalpindi, are in custody and the prosecution had framed specific charges against some of them. FIA is expected to make more arrest before collecting other evidence. In any case, the Government of the day was responsible for the murder. There is a definite possibility that some of the officials might have been involved in the criminal conspiracy to assassinate the former Prime Minister. Sooner or later, the Government will have to frame criminal charges against former military dictator General ® Pervez Musharraf in the Benazir assassination case. If it is confirmed that some higher officials of the Government had issued those instructions, then there is a possibility that the former Military dictator will face direct murder charges. The law will take its natural course and the sitting Government is determined to expose the conspiracy before the end of its present political tenure. Two NATO helicopter gunships violated Pakistan’s air space in its northwest border area Monday morning. Two Nato helicopters violated Pakistan’s border limits on Monday morning, entering through the Torkham border located in Khyber Agency, said security officials. According to details, the helicopters penetrated into the Pakistani territory near Torkham and remained there for about five minutes before they returned to Afghanistan. No firings have been reported. Security officials are investigating the matter. Such incidents occurred several times in the last few months. Earlier this year, NATO helicopters entered the Pakistan’s territorial sky, killing three Pakistani border soldiers while intending to attack some militant’s hideouts on the Pakistani side. This incident has led to a closure by the Pakistani government of a border pass for NATO convoys supplying goods and fuel to the U.S.-led NATO troops stationed in Afghanistan via Pakistan, leaving hundreds of NATO supply trucks stranded on the way, falling prey to numerous terrorist attacks. EDITORIAL (December 27, 2010) : Don’t cross the ‘red lines’, Pakistan has warned the United States, saying it could complicate counter-terrorism co-operation. One of the red lines is to refrain from landing its boots on Pakistani soil, and the warned ‘complication’ is that in case of territorial invasion, Pakistani people would not stay neutral and join the side of the Taliban militants – a strong possibility, the taste of which was given to Nato sometime back when scores of its supplies containers, were burnt down in retaliation of an incursion. Pakistan’s position stems from the fact that the Nato and Isaf mandate is restricted to Afghanistan. In fact, even the drone attacks that the CIA is carrying out in the border areas of Pakistan are in violation of international law and are not covered by the UN mandate – which in itself, was against the spirit of the principles of justice. The fact is that Pakistan’s co-operation in the US-led Nato military campaign in Afghanistan has lost public support and for the Zardari-Gilani government, it’s a hell of an unpopular mission to stay committed to. No doubt with only six months left for President Obama’s deadline to commence troop drawdown in Afghanistan, a kind of angst seems to be pushing his administration to justify withdrawal when the war is far from over and victory is uncertain. The public in the United States and its allies are increasingly critical of their governments’ commitment to an unnecessary and unwanted conflict in a far-off Afghanistan. Their perception is that after nine years of bloody battles and murderous raids by the Isaf forces, the adversary remains defiant and largely unsubdued. No wonder their public wouldn’t mind their soldiers’ quiet departure from Afghanistan irrespective of victory or defeat, but that’s not the case for their commanders. So, as the endgame unfolds, the generals are hectically searching for a scapegoat – which, if the recent ‘disclosures’ in some of the American papers is any indication, is going to be Pakistan. The blame for failure in Afghanistan, now being pinned on Pakistan for allegedly providing ‘safe havens’ to Afghan insurgents, is gaining unanimity among US military circles to put its boots on the ground in Pakistan, say the newspapers. Without going into the debate whether the urge to expand military operations into Pakistan will help President Obama vindicate his pledge to begin a troop drawdown next July or not, we in Pakistan would insist that the envisaged incursions entail dangerous consequences not only for the Nato’s engagement in Afghanistan but also for the peace of the entire region. The people of Pakistan will stand up to this aggression leaving the military leadership and the government of Pakistan with no option but to make a complete U-turn on its so-called anti-terrorism alliance. If at all there was a justification for the UN mandated invasion of Afghanistan, that’s not available anymore. What is now going on in that country is essentially a civil war, where outside interference if mandated by the United Nations, should merely be for peacekeeping and not geared to win victory for a certain group of people. Going by the reports over the past several years, the epicentre of terrorism is now located in Europe and North America where certain sections of the public are increasingly prone to be radicalised – for whatever reasons. Ambassador Hussain Haqqani has rightly pointed out that instead of ‘rather than blaming Pakistan, the West should concentrate and focus on how to end increasing radicalisation’. As they say, for the generals, advancing ahead and winning victories is not as challenging as staging a safe and secure retreat. 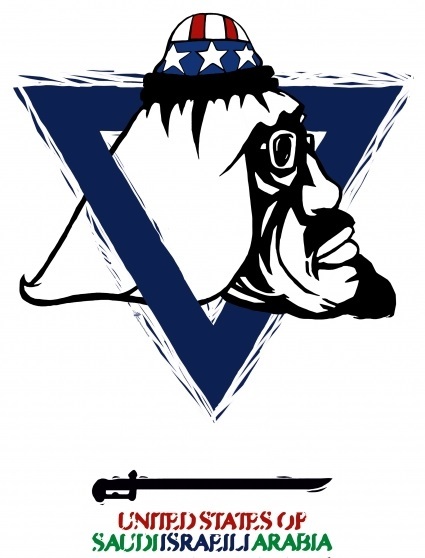 That seems to be quite a dilemma for the Isaf generalship as it finds itself caught between President Obama’s unalterable withdrawal timeline and a battlefield victory that should not appear to be Pyrrhic. After all, what more can Pakistan do – after being fully sucked into an unwanted war with all its enormous collateral cost in terms of loss of life and property, socio-economic turmoil and earning the epithet of the world’s most dangerous place to visit. There is a need for its so-called allies in this war on terrorism to comprehend the myriad thankless consequences Pakistan is suffering in return for its commitment to remain a faithful ally. The truth is that Pakistan’s patience with the unsavoury statements and ungrateful behaviour of its allies is wearing thin and has arrived at a tipping point. Should something like the recently reported plan of crossing the ‘red lines’ come to happen, we would have come to the fork, and today’s friends may be tomorrow’s foes. waves of Arabian Sea which crashes on the shore. protocol that is never spoken in the press. being reduced to semiotic ghosts. 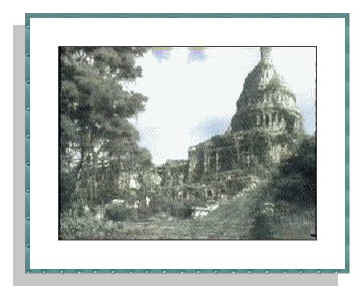 land at Madban, Karel, Niveli and Mithgavhane in Rajapur Taluka. contractor and his men on one side and villagers on the other side. Finland for its flawed design and construction of reactors. cleaning up operation is still on, according to reports. contaminate of water bodies in the surroundings. The pollutants e.g. to human beings but also to the trees, livestock, fish and environs. tumors, cancer, infertility, congenital deformities, stillbirths etc. Harrisburg, Pennsylvania, disaster struck in Three Mile Island. has dropped from 30 rems per year in 1934 to 5 rems per year in 1987.
health effects of radiation became further understood. genetic damage may appear many years or decades after exposure. facilities, uranium mines and test sites. radiation exposure up to 28 days of gestation. and 50 for 50 percent). It is about 4 seiverts for adults. Reaching Critical Will- Health Effects and the Nuclear Age. studies. He can be contacted at sharanprabhat@gmail.com.